At the height of WWII, a group of German officers hatched a plot to assassinate Hitler and seize control of the military command in order to end the war. 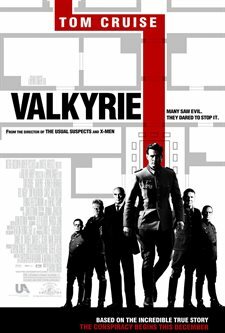 The operation was code-named "Valkyrie", for the emergency plan that was meant to be used in case of a revolt against the Nazi government. This plan had been modified by the conspirators to ensure their success, but for various reasons the plot failed when finally carried out on 20 July 1944. The conspirators of the inner circle were shot after a kangaroo trial or sentenced to death soon after. Download Valkyrie in Digital HD from the iTunes store. Valkyrie images are © MGM Studios. All Rights Reserved. This honestly is a hard movie to review. We can give away the plot, since it's based on a true story (they don't kill Hitler), so all that's left is the technical aspects of the film. Valkyrie has an amazing mix of very talented actors, that at times appeared to be a reunion from Pirates of the Caribbean. Bill Nighy (Davey Jones) plays General Friedrich Olbricht, Tom Hollander (Lord Cutler Beckett) plays Colonel Heinz Brandt, who is Hitler's attaché, David Schofield (Mercer) plays Erwin von Witzleben, and Kevin McNally (Gibbs) plays Dr. Carl Goerdeler, a politician. We also have Kenneth Branagh (Henry V, Hamlet, Much Ado about Nothing) as Major General Henning von Tresckow, Tom Wilkinson (Michael Clayton, The Patriot) as General Friedrich Fromm, Terence Stamp (Superman II, Get Smart) as Ludwig Beck, and Eddie Izzard (The Riches) as General Erich Fellgiebel. All of these actors gave it their all, and contributed enormously to the film. Then we get to the star of the film, Tom Cruise, who plays the "hero" of this story, Colonel Claus von Stauffenberg. We are introduced to Col. Stauffenberg first thing, as he is writing in his diary (while stationed in North Africa as part of the Afrika Korps) about how he dislikes what Hitler has done to his beloved Germany, and how he only hoped that there was a higher-up in the military that feels the same way. His camp is then attacked by American fighter planes, and during the attack he suffers injuries that result in losing his right hand, two fingers from his left, and his left eye. After he recovers, he is transferred to a desk top in Berlin assigned to (you guessed it!) a general who feels the same way he does about Hitler (General Friedrich Olbricht). Stauffenberg is recruited by this group of military personnel and politicians who want to see Hitler removed from power and a truce negotiated with the Allies to end the war. As we know from history, their attempt to kill Hitler fails, and almost everyone involved is executed later. But what about the film? It isn't a problem that the actors don't use German accents in the film: basically everyone in the film is German, so what we're watching is a film in English for America/England, so there is no need to fake accents on everyone that would be speaking the same language if this film had been made by Mel Gibson (The Passion of the Christ, Apocalypto) . The film is directed by Bryan Singer, and in whole he does a good job with what he was given. The film stumbles around some of the details of the plot, and with the leading actor. Tom Cruise appears to have taken lessons from Kevin Costner for this film. It's like he couldn't act his way out of a paper bag. It is like watching Tom Cruise play himself for the role, while I could believe the other actors, especially Terence Stamp, Bill Nighy and Tom Wilkinson's performances, all three of which shine in this movie. Tom needs to go back and just play Les Grossman for a while. At least he was truly funny and I did believe he was acting rather than just playing himself with a uniform on. The other stumble was with the plot, mostly because of the motives behind the reason to kill Hitler. Yes, with hindsight, everyone should have wanted to kill him, but in real life, the group that wanted to kill him didn't want to undo everything Hitler had done – originally they still wanted to keep Poland, Austria and Hungary as part of the German Empire. By the time the July 1944 rolled around, they were willing to accept a lot less since they knew the Allies wanted unconditional surrender. There wasn't enough back-story to understand and accept why all these people hated Hitler, especially since Col. Stauffenberg made his diary entry *before* he lost body parts. In fact, almost none of the characters ever discussed why they wanted to see the plot to kill Hitler succeed. Even with these stumbles, this film was ever so close from being a almost perfect film, but unfortunately the leading actor's performance drags it down. Without his performance, this film would be either a B+ or an A-. The other actors held this film on their shoulders but it isn't enough.